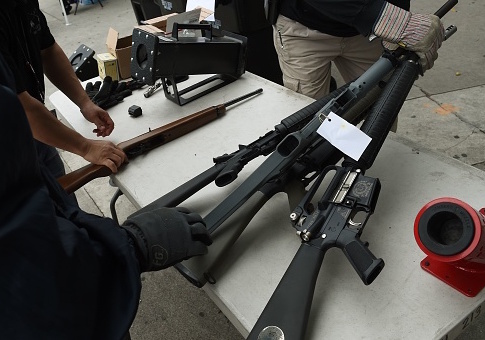 A California-based gun-rights group told the Washington Free Beacon on Wednesday the state has managed to register less than 5 percent of the guns required to be registered under California's latest gun ban. The Firearms Policy Coalition (FPC) said the likely registration rate of "bullet-button assault weapons" was only about 3 percent of the total number of firearms in California that fall under the state's latest expansion of its "assault weapons" ban. State documents obtained by the group through freedom of information requests show the Department of Justice approved 6,213 individuals to register 12,519 firearms under the new law by the end of June. It rejected a further 1,373 registration attempts. As of June 30, 2018, 52,443 applications for registration were pending. "In 2016, I predicted ‘mass noncompliance with these laws,' and that seems to be what happened," Brandon Combs, FPC president, told the Free Beacon. "I think there are a number of reasons people didn't register as many firearms as many originally expected. First, the legislature refused to require DOJ to do any outreach or education campaigns to inform gun owners about the law changes. In spite of our many requests for outreach during the legislative cycle for SB 880 and AB 1135 in 2016 and showing that historically a major law change like this came with an outreach program, they just refused to add outreach to the bills. Because of that, many gun owners probably have no idea that the laws changed and that they could be in serious legal jeopardy." Combs also pointed to the state's arrest of a man who had attempted to comply with the law as a major deterrent to many gun owners who feared trying to comply with the law could unwittingly place them in legal jeopardy. "Moreover, many gun owners are resistant to registration schemes because they know that registration will lead to confiscations and arrests," he said. "And the news reports during the registration period about DOJ using the system to get warrants and conduct raids probably confirmed that viewpoint and made a lot of gun owners nervous." The final factor Combs cited has also lead to a lawsuit against the state: the registration system is alleged to be filled with bugs and a number of gun owners have claimed they couldn't use it to register their firearms despite their best efforts. "And, of course, the fact that DOJ's system crashed all the time prevented many people from registering their guns even when they wanted to," he said. "That's the crux of our new Sharp v. Attorney General Becerra lawsuit." California's latest gun registration effort is far from the only one that has resulted in abysmal compliance numbers and system-wide bugs. In February, New York's new requirement that those with pistol licenses recertify went unheeded by as many as 50 percent of gun owners. Connecticut faced similarly dismal compliance with its own "assault weapons" ban in 2014. This entry was posted in Issues and tagged California, Gun Control, Guns, New Gun Laws. Bookmark the permalink.